Chautems, A. (2009). 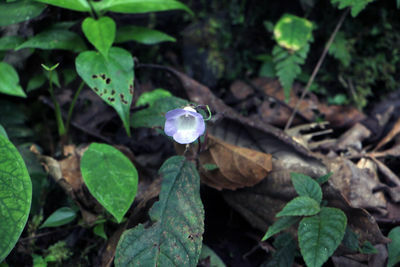 Neotropical Gesneriaceae. Adapted from Weber (2004), with pollen data from E. Gasparino (unpublished thesis, 2008). Perennial herbs with basalscaly rhizomes, tubers or fibrousroots, subshrubs, small trees, vines, climbers or epiphytes. Leavessimple, opposite or in whorls, rarely alternate; green, sometimes reddish or with wine-red blotch on abaxial face, stomata scattered or in groups. Inflorescences of pair-flowered axillary cymes , pedunculate or epedunculate, bracteolate or ebracteolate, one to many-flowered. 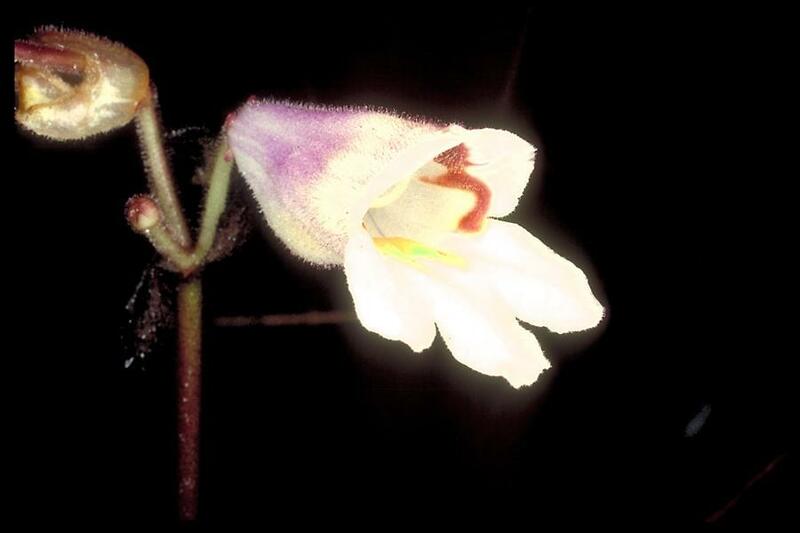 Flowers gamopetalous, zygomorphic, rarely actinomorphic, of various shapes, white or brightly colored. Stamens 4, rarely 5, staminode usually present, anthers cohering in pairs or all together, sometimes free. Nectary annular or consisting of 2 to 5 separate glands, free from the ovary wall, rarely reduced and non-functional, or completely lacking, sometimes replaced by an osmophore near the base of the corolla. Ovarysuperior, semi- or completely inferior, usually ovoid or globose, unilocular, placentae parietal, T-shaped in cross-section. Fruit a dry or fleshy 2-(rarely 4- ) valved capsule with placentae exposed as a central cone or split in two (display capsule), or an indehiscent white or colored berry. Seeds usually without surface ornamentation of testa cells, often striate. Seedlings isocotylous. The family forms a monophyletic group within Lamiales. The subfamily Gesneroideae is exclusively neotropical. 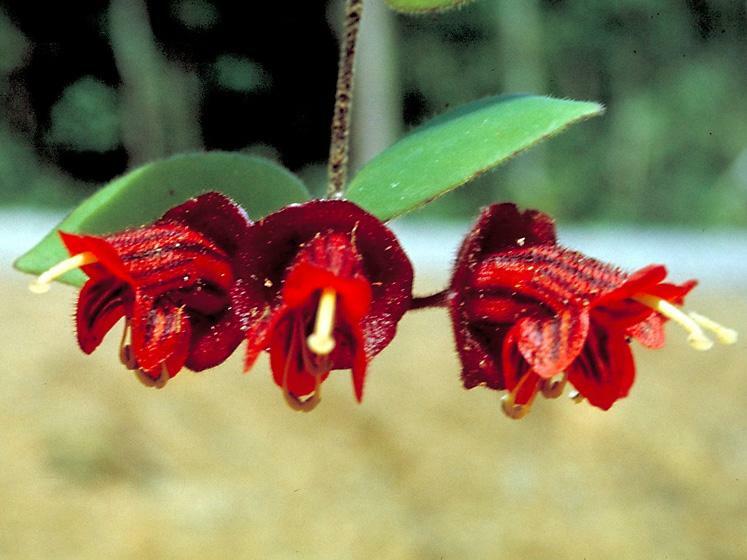 7 tribes are recognized, i. e. Beslerieae (BESL), Episcieae (EPIS), Gesnerieae (GESN), Gloxinieae. (GLOX), Napeantheae (NAPE), Sinningieae (SINN) and Sphaerorrhizae (SPHAE). 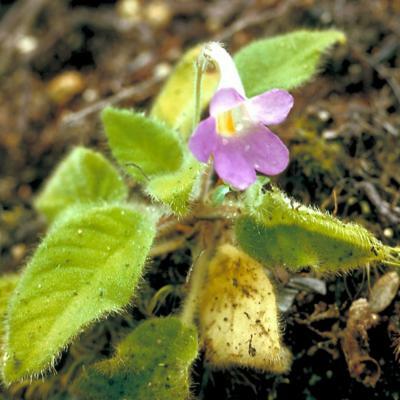 Some genera are cultivated as ornamentals (mostly indoor plants), and among the most popular are Achimenes, Codonanthe, Columnea, Gloxinia, Episcia, Kohleria, Nematanthus, Sinningia, Seemannia. They also hybridize easily within related groups and many cultivars are available. Distribution and ecology: rain forest on mountain slopes with main diversity center between Colombia and Peru (over 400 spp.) and secondary centers in Central America (ca. 250 spp. ), eastern Brazil (over 200 spp. ), Guiana shield (ca. 100 spp.) and tropical Mexico (ca. 100 spp.). 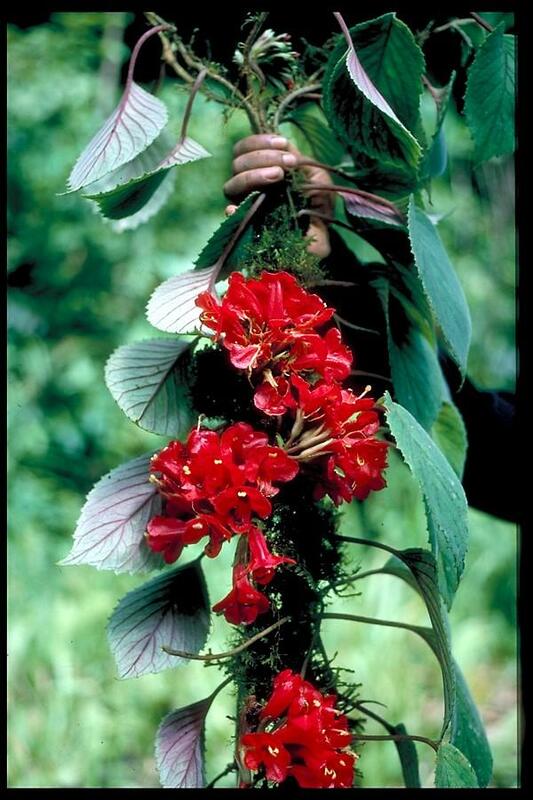 Achimenes Pers., GLOX/ 27: Mexico, C. America, Caribbean, N. South America. Alloplectus Mart., EPIS/ 6: NW South America, Costa Rica. Alsobia Hanst., EPIS/ 2: Mexico, Costa Rica. Amalophyllon Brandegee, GLOX/ 5: Mexico, NW South America. Anetanthus Hiern ex Benth., BESL/ 2: Colombia to Bolivia, C Brazil . Bellonia L., GESN/ 2: Cuba, Hispaniola. Besleria L., BESL/ 150: Widespread. Chrysothemis Decne., EPIS/ 6: Caribbean, Guatemala to Ecuador, Guianas, N Brazil. Cobananthus Wiehler, EPIS/ 1: Guatemala & Honduras. Codonanthe (Mart.) Hanst., EPIS/ 19: Widespread. 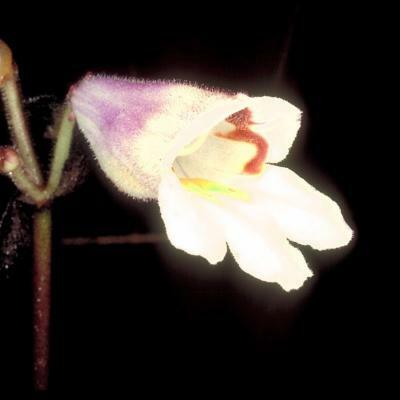 Codonanthopsis Mansf., EPIS/ 4: NW South America, N Brazil, Guianas. Columnea L., EPIS/ 200: Mexico to Bolivia, Guianas, Caribbean, E Brazil. Corytoplectus Oerst., EPIS/11: NW South America to Bolivia, Guyana, N Brazil. Crantzia Scop., EPIS/ 4: Venezuela, Guyana, Caribbean. Cremersia Feuillet & L. E. Skog, EPIS/ 1: French Guiana. Cremosperma Benth., BESL/ 21: Costa Rica to Peru. 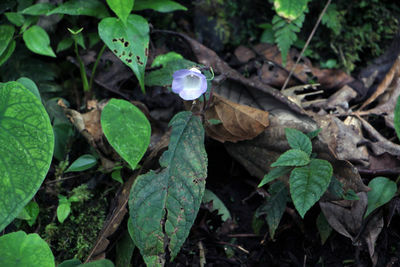 Cremospermopsis L. E. Skog & L. P. Kvist, NAPE/ 2: Colombia. Diastema Benth., GLOX/ 21: Mexico, NW South America. Drymonia Mart., EPIS/ 70: Widespread. Episcia Mart., EPIS/ 8: Mexico to Peru, N Brazil, Guianas. Eucodonia Hanst., GLOX/ 2: Mexico. Gasteranthus Benth., BESL/ 38: Mexico to Bolivia. Gesneria L., GESN/ 55: Caribbean. Glossoloma Hanst., EPIS/ 22: Mexico to Bolivia. Gloxinella Roalson & Boggan, GLOX/ 1: Peru. Gloxinia L'Her., GLOX/ 3: C & S America, Caribbean. Gloxiniopsis Roalson, GLOX & Boggan/ 1: Colombia. Goyazia Taub., GLOX/ 2: C Brazil. Heppiella Regel, GLOX/ 4: NW S America, Venezuela. Kohleria Regel, GLOX/ 20: Mexico, NW South America, Caribbean. Lampadaria Feuiilet & L. E. Skog, EPIS/ 1: Guyana. Lembocarpus Leeuwenb., EPIS/ 1: French Guiana, Surinam. Mandirola Decne., GLOX/ 3 : C Brazil. Monopyle Moritz ex Benth., GLOX/ 18: Guatemala to NW South America. Moussonia Regel, GLOX/ 12: Mexico to Panama. Napeanthus Gardner, NAPE/ 18: Mexico to South America. Nautilocalyx Linden ex Hanst., EPIS/ 51: Widespread. Nematanthus Schrad., EPIS/ 30: E Brazil. Neomortonia Wiehler, EPIS/ 2: Mexico, C. America to Ecuador. Niphaea Lindl., GLOX/ 4: Mexico, C America. Oerstedina Wiehler, EPIS/ 3: Mexico, C America. Paliavana Vand., SINN/ 6: E Brazil. Paradrymonia Hanst., EPIS/ 38: Mexico to Bolivia, Guianas, N Brazil. Pearcea Regel, GLOX/ 17: Colombia to Bolivia. Pheidonocarpa L.E.Skog, GESN/ 1: Cuba, Jamaica. 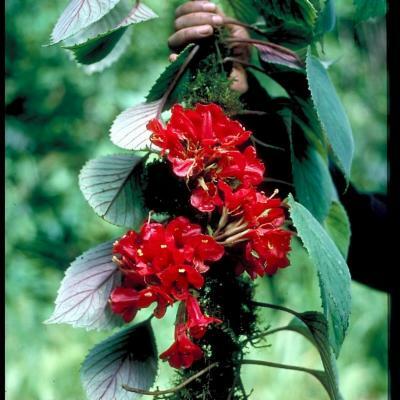 Phinaea Benth., GLOX/ 3: Mexico, NW South America, Caribbean, N Brazil. Reldia Wiehler, BESL/ 5: Costa Rica to Peru. Resia H.E.Moore, NAPE / 2: Colombia, Venezuela. Rhoogeton Leeuwenb., EPIS/ 2: Venezuela, Guyana. Rhynchoglossum Blume, Epithematoid/ 1: Mexico to Honduras, Costa Rica to Peru (only genus belonging to the paleotropical Epithematoid group with one species ocurring in the Neotropics). Rhytidophyllum Mart., GESN/ 18: Caribbean. Rufodorsia Wiehler, EPIS/ 4: Nicaragua to Panama. Seemannia Regel, GLOX/ 4: Ecuador to N Argentina, Brazil. Sinningia Nees, SINN/ 72: Mexico to S America. Smithiantha Kuntze, GLOX/ 6: Mexico. Solenophora Benth., GLOX/ 16: Mexico to Panama. Sphaeorrhiza Roalson & Boggan, SPHAE/ 3: C. Brazil. Tylopsacas Leeuwenb., BESL/ 1: Venezuela, Guyana. Vanhouttea Lem., SINN/9: E Brazil. Inflorescence formed by an indeterminate thyrse with axillary pair-flowered cymes. Ovary unilocular with lateral/parietal, T-shaped placentae. Anthers often cohering at apex or side by side. Stipules never present, leaves never compound (vs. Bignoniaceae with compoubd leaves). Latex never present (vs. Campanulaceae which usually has white latex). Flowers mostly reddish or purple. Like other members of tribe Gloxinieae they possess perennialscaly rhizomes. Like many members of tribe Episcieae with fleshy leaves, sometimes growing in ant-gardens, and white flowers. Strongly bilabiate and brightly colored corolla representing typical humming-bird flowers. Ventricose and brightly colored flowers, often resupinate. Usually with well-developed basal tubers. Roalson, E. H., J. K. Boggan, L. E. Skog. 2005. 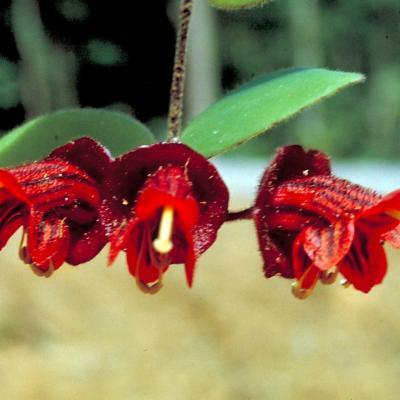 Reorganization of tribal and generic boundaries in the Gloxinieae (Gesneriaceae: Gesnerioideae) and the description of a new tribe in the Gesnerioideae, Sphaerorrhizae. Selbyana 25: 225-238. Skog, L. E & Boggan, J, (2006). A new classification of the western hemisphere Gesneriaceae, Gesneriads 3: 12-19. Souza, V. C & Lorenzi, H. (2008). Botánica sistemâtica, 2nd edition. Instituto Plantarum, Nova Odessa-SP, Brazil., p. 561-565. Weber, A. in Kubitzki, K. (ed.) (2004), The families and genera of vascular plants, vol. 7, Dicotyledons, Lamiales (except Acanthaceae incl. Avicenniaceae), vol. ed. J. W. Kadereit, Berlin/Heidelberg, Springer, p. 63-158. Stamens usually two or four, rarely five, adnate to the corolla tube. Placentation parietal, each placenta bilamellate, these occasionally becoming fused centrally, the capsule then appearing biolocular. Seeds numerous, small, ellipsoid or fusiform, sometimes with hair-like appendages at each end; endosperm absent or very slight. They often favour shaded habitats and are frequently epiphytic or lithophytic. African genera belong to the subfamily Cyrtandroideae and either occur in Asia or have affinity with genera there. They are not closely related to the genera of the Neotropics; characters unique to that region are therefore omitted from the above family description. Range: The African Violet family has some 140 genera (7 in mainland Africa) and approximately 2900 species, mainly in the tropics and subtropics but with a few genera in temperate Eurasia. Anetanthus Hiern ex Benth. & Hook.f. Monopyle Moritz ex Benth. & Hook.f.